(Bloomberg) -- A quarter-century ago, Beijing Electron teetered on the brink of collapse, a government behemoth brought to its knees by superior foreign technology. Decades later, fueled by billions in state funds, a re-christened BOE Technology Group Co. does business with Apple Inc. and has its sights on becoming the biggest supplier of next-generation screens. It’s a turnaround authored by Wang Dongsheng, a low-profile accountant who took over an ailing vacuum-tube factory -- then begged his underlings for bailout money, at one point dabbling in producing mouthwash to make ends meet. 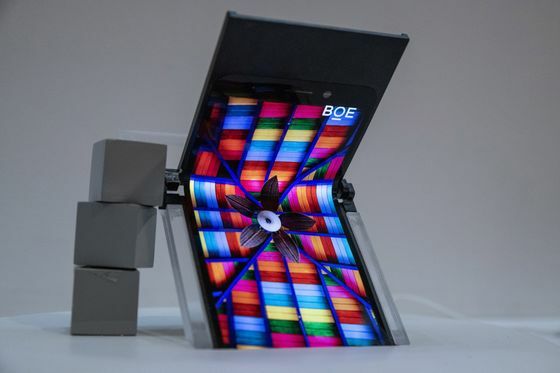 But he ultimately secured capital from Beijing to build the biggest producer of flat displays, and devised BOE’s ascension to the pinnacle of screen-making: mastering bendable displays set to underpin a generation of malleable smartphones from the Samsung Fold to -- maybe -- a future iPhone. Today, BOE is a symbol of China’s remarkable technological ambitions. Its brush with death -- it came close twice -- is nowhere in evidence on a stroll through a $7 billion factory on the outskirts of Chengdu, a western Chinese city better known for spice and pandas. Big enough to cover 16 football fields, it cranks out expensive organic light-emitting diode displays that Apple and Huawei Technologies Co. are keen to put in their marquee devices. By the end of this year, BOE will become the world’s No. 2 purveyor of phone OLED displays -- trailing only Samsung Electronics Co. -- with a monthly capacity of roughly 64,000 panels, said Zhang Yu, a senior vice president who oversees marketing. 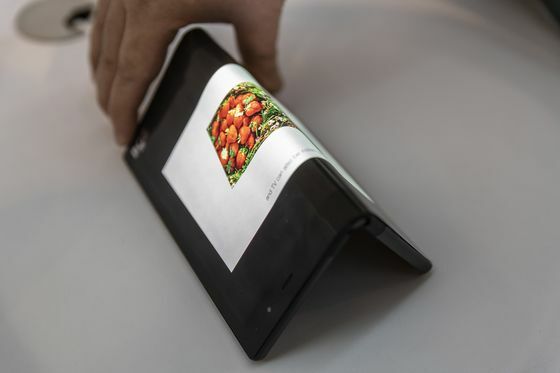 That’s enough to coat 6 million foldable phones a month as it also eyes customers in wearable devices, car dashboards, appliances and TVs. Getting onto the iPhone, as some analysts anticipate, would vault it into the rarefied echelons of the $39 billion market for smartphone displays. Propelling BOE’s ascent is state largess. It’s inked deals with officials across the country, including government-backed entities that agreed to help it raise at least 20.5 billion yuan for another plant in southern China’s Fuzhou. Other help came in the form of land, energy and favorable policies. It’s that sort of aid that’s got the Trump administration on edge, but it’s not all about handouts. 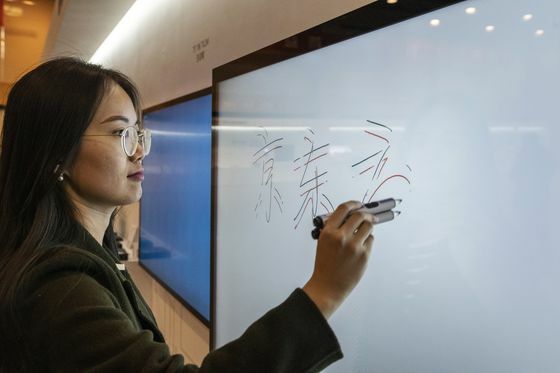 To fuel its expansion BOE’s debt has rocketed four-fold to a record 118 billion yuan since it began developing OLED around 2014. 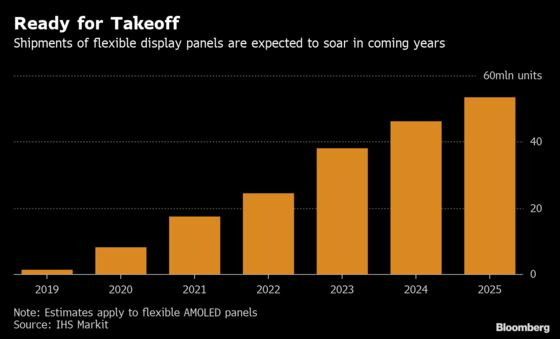 But with those plants meeting just half of its envisioned appetite for OLED, BOE is plotting replicas in neighboring Chongqing and in Fuzhou, targeting mass production as early as 2020. Those projects will cost $14 billion. It’s also starting to test production of much larger panels (almost 10 square meters) in Hefei, for bigger devices such as TVs. That project may eventually compete against LG Display Co. But it also raises the prospect of too much production coming on to the market, increasing risks for a company that had 2018 revenue of 96 billion yuan and has a market value of about $20 billion. 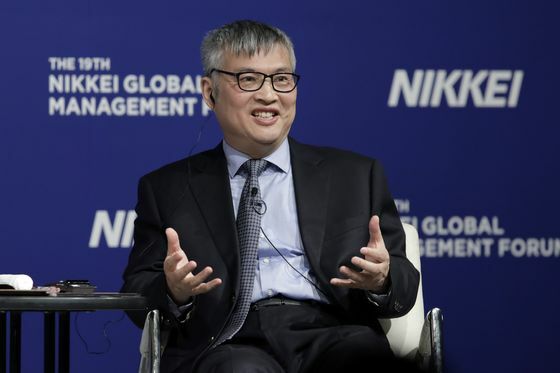 Wang, then chief accounting manager, could have secured a better salaried job elsewhere but the 61-year-old was appointed chief, and decided to give it one last try. He kicked off reform in 1992, asking management and workers to collect capital to stave off bankruptcy. Desperate to keep the factory afloat, Zhang said about 2,600 employees ponied up a little more than 6.5 million yuan ($1 million), with some people giving out five years’ salary.